ARE YOU TIRED OF THE SAME OLD routine? Do blue Mondays get you down? Do you look forward to Wednesday only because it-s the halfway point in your week-at-atime, clock-watching existence? If you-re ready to break out of your routine, Access Realty can help. Surf City-s Gateway Condominiums, a new premier resorttype development, gives you the option to live it up every day of the week. Whether you are looking for a large home for your family or taking in the single life, Gateway promises you the standard of living you-ve been dreaming about. The only reason to watch the clock is to make sure you don-t miss the gorgeous coastal sunsets from your own private balcony. Some units also include a sun room. 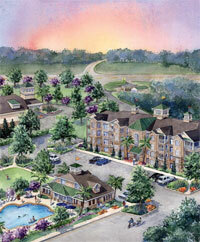 Gateway Condominiums offer affordability and convenience. The condos, located on the outskirts of town, range in size from 1,800 square feet for a four-bedroom, three-bath unit to a smaller version with two bedrooms and two baths. All units come in a variety of open floor plans. You can-t find a better place to call home than Surf City-s Gateway Condominiums. Centered between Jacksonville and Wilmington, along North Carolina-s magnificent coast, only a mile from the nearest beach, Gateway offers hardwood or tile flooring, granite counter tops and upgraded appliances. Convenience is another reason to choose Gateway Condominiums. Since everything you need is within walking distance, you-ll no longer have to get back in your car for a trip to the grocery store after a long day at work. The complex even includes an urgent-care health facility. Are you interested in expanding your horizons? You can use the spacious, on-site clubhouse for social activities with family and friends, enjoy the state-of-the-art workout room or relax after a tough day at work beside the large swimming pool. Gateway even offers a game room to keep the kids happy. Starting at only $235,000, Surf City-s Gateway Condominiums are an option for almost everyone. "Gateway has everything you need in a community," says Access Realty-s Anita Afify. She and the rest of the team at Access Realty understand what it takes to find the perfect home. To start making plans for your move to Gateway Condominiums, call (800) TOPSAIL or (910) 328-4888 or visit www.AccessTheBeach.com.